And that’s good news for the progressive mayor. 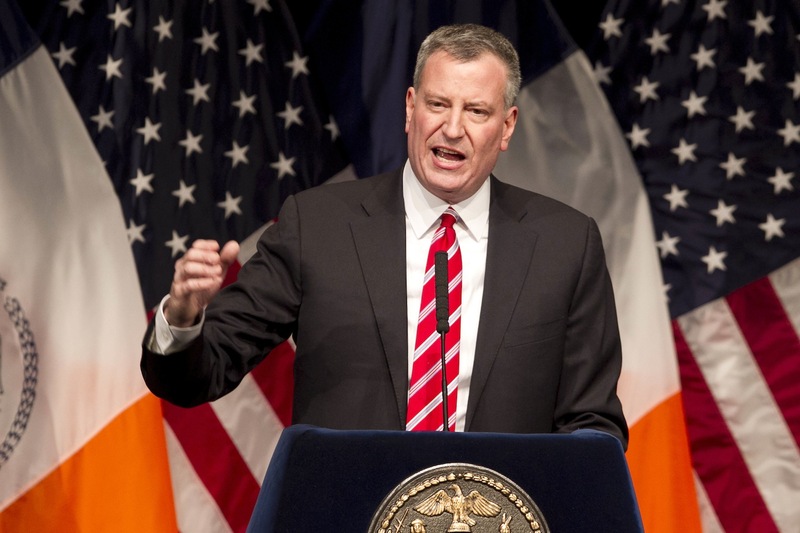 About half of New Yorkers approve of Bill de Blasio's performance so far in City Hall, but the new mayor has yet to prove his leadership in several areas, says a New York Times/Sienna College poll released today. The poll found 49 percent approved of the mayor's work to date, while 31 percent disapproved and 19 percent said they didn't know. When it comes to his personal favorability, the numbers break 47/23/29 percent. Most believe he's focusing on issues that matter to people like them, and most feel he cares about their needs and problems “some” or “a lot.” Asked if they think voters made the right choice or a mistake in electing de Blasio, 59 percent said it's too early to say; among those who did weigh in, 26 percent thought they'd made a good choice and 13 percent thought the city made a mistake. On housing, jobs, income inequality and the quality of public schools, more New Yorkers disapprove or de Blasio's work so far than approve. But when it comes to keeping New Yorkers safe, 70 percent say they approve of the job he's doing. The glass-half-empty take on the numbers is that de Blasio's huge electoral mandate—he won 73 percent of the vote in November—has either vanished or was never there in the first place. But after the charter-school blow-up and the minor scandals of the first three months, it's not bad news that more New Yorkers like the job de Blasio's doing, like him personally, think his heart's in the right place and believe he's got crime (which was, in Joe Lhota's dark vision of the future, going to be his undoing) under control. The high numbers of undecideds are people the mayor still has a chance to convert. The city certainly hasn't turned against him. The very fact that he has yet to measure up to people's expectations when it comes to the handling of income inequality indicates just how significant a vein of sentiment de Blasio's mayoral campaign tapped. There's always been the question of whether he raised expectations unrealistically high. But, 98 days in, he's got time to reach closer to that bar, and most New Yorkers are either on his side or withholding judgment. You know, the FOIL process – I am not a lawyer – but you know, the FOIL process is delineated and is pursued whenever a request comes in. You know, what we have said to our team is we’re going to process those, get the answer back. Obviously, if at any point a journalist or any other organization isn’t comfortable with the outcome of the FOIL request, there is an appeals process. So I’m not familiar with the details of it, but that’s the way it works. The jury may be out on de Blasio in general, but when it comes to that answer, I'm going to render a bench verdict of “lame!"